with Erin V. White, “Southern Gothic, A Tale of Tombstones, Tourism, and Preservation at the American Cemetery of Natchitoches Louisiana,” The Thrill of the Dark: Heritages of Fear, Fascination and Fantasy, April 25-27 2019 Birmingham, U.K.
“Introduction to Decolonizing History: Native American and Indigenous Studies” (invited lecture) El Centro College Feb 3, 2018. “Lewis and Clark Expedition.” History of Cartography, Vol. 5: The Cartography in the Nineteenth Century, ed. Roger J.P. Kain. Under Contract to the University of Chicago Press. “John Wesley Powell” History of Cartography, Vol. 5: The Cartography in the Nineteenth Century, ed. Roger J.P. Kain. Under contract to the University of Chicago Press. “Southern Native Resilience and Nation-Building in the Twentieth Century: A Roundtable Discussion.” Southern Historical Association 83rd Annual Meeting, Dallas TX, November 2017. “The Historic Tribes of Texas” (invited lecture, Native American Heritage Month Event) Tarrant County College, November 1, 2017. “Mapping Indian Country: Culture Areas, Linguistic Stocks, and the Genealogy of a Map” (Poster presentation). American Historical Association 131st Annual Meeting, January 2017. Interview on Louisiana Anthology Podcast 183 and 184, November 18, 2016. “Native Peoples Should Tell Their Own Stories”in Denise E. Bates, ed. From the Source: Southern Native Peoples on Living and Thriving in the 20th Century and Beyond. University Press of Florida, 2016. Choctaw-Apache Foodways. Stephen F. Austin State University Press, 2015. “Constructing Transatlantic Spaces” (invited panelist) The 16th Annual International Graduate Student Conference on Transatlantic History, The University of Texas at Arlington. September 2015. “Culinary crossroads: Traditional foods of the Sabine Parish Choctaw-Apache Community” Seventh Annual Louisiana Studies Conference, September 2015. Nicola Pizzolato. Challenging Global Capitalism: Labor Migration, Radical Struggle, and Urban Change in Detroit and Turin (book review) Traversea: A Journal of Transatlantic History Vol 4 (2014). “Choctaw Frontier: Westward migrations prior to Indian Removal.” United Choctaw Conference, October 2014. Persistence on the Edge: The Choctaw-Apache Community of Ebarb.“Beyond the Bayuk: Louisiana’s Indigenous Diasporas and Transnational Traces.” Native American and Indigenous Studies Sixth Annual Meeting, May 2014. Lasting Imprint: An investigation into indigenous toponyms and the European and Euro-American record of population settlement and territory along the Louisiana-Texas borderlands. Spring Meeting of the Texas Map Society, April 2014. Apaches in Louisiana? The Ebarb Communiy’s Lipan Connections. “Border Crossings and Boundaries: How the Apaches Defied Geographical and Cultural Borders.” The 118th Meeting of the Texas State Historical Association, March 2014. “Making their own freedom, The Amistad Rebellion An Atlantic Odyssey of Slavery and Freedom By Marcus Rediker” (Book review) Against the Current. 168. January-February 2014. Choctaw-Apache Territoriality along the Louisiana-Texas Borderlands. “Indigeneity in the Imperial Periphery.” The 14th Annual International Graduate Student Conference on Transatlantic History, The University of Texas at Arlington. October, 2013. “Hispanic Roots of Creole Cuisine” in H.F. “Pete” Gregory and Sheila Richmond, eds. Hispanic Roots in Creole Culture. 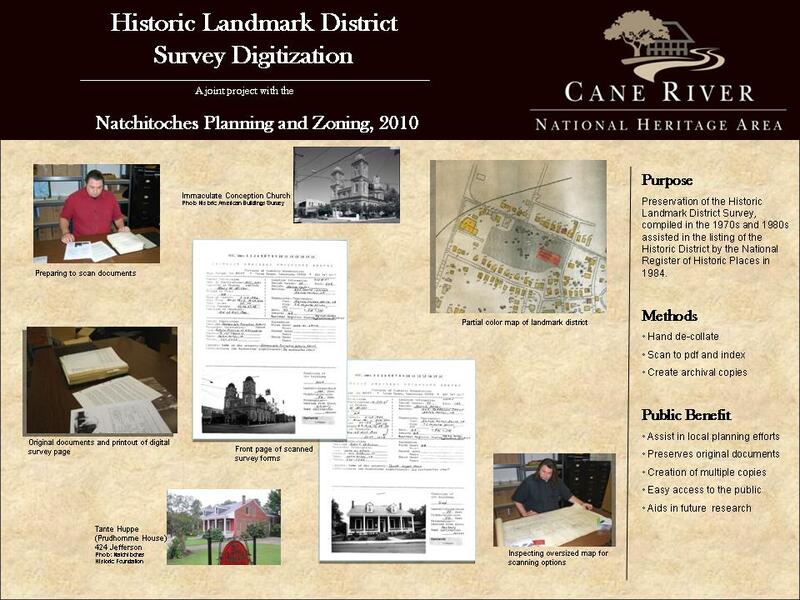 Creole Heritage Center: Natchitoches, LA, 2013. “Choctaw Come to the Caddo Homeland” 54th Annual Caddo Conference (March 2012). Historic American Buildings Survey. Deblieux Building. 550 Front Street (Commercial Building). See portfolio section on Documentation and Preservation for more details. “People on the Camino Real Past and Present” (with Hiram F. Gregory and George Avery) at the Second Annual Louisiana Studies Conference (September 2010). Historic Landmark District Survey Digitization (Preservation in Your Community Poster Session at the National Center for Preservation Technology and Training, September 2010). Presentation on basic materials conservation, ensuring preservation of the documents and improving access to the information for researchers. From Pirogues to Locomotives Annotated Bibliography on Natchitoches’ Transportation History. Ceremonial Gathering of the Aimedaca Oddac (A Tribute to Horace Miner) Paper on relationship of Archaeologists to indigenous peoples done in the style “Body Ritual among the Nacirema” by Horace Miner. For site visits and short pieces, visit my blog.